The app wars are still on with Android and iOS apps on the rise every day. Speaking of which, the Apple App Store is about to hit 25 billion downloads. A special countdown on Apple’s site is clocking fast and by the looks of it, the numbers should reach 25 billion in about 2-3 days, as we last saw the numbers climbing up the 24.32 billion mark. 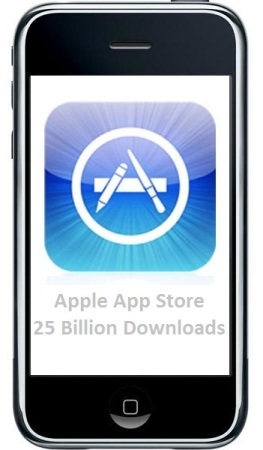 Apple had officially opened up the App Store on July 2008 and had reached 10 Billion App downloads on 22 January 2011. Since then the numbers have been increasing like crazy! July 2011 saw over 15 billion app downloads and today we see that Apple is on the verge of reaching 25 billion app downloads. Comparing to Android, Apple is far ahead as the Android Market saw 10 billion app downloads in the month of December 2011. If there is any consolation, Android still has the most number of free apps which constitutes about 68% of the total apps on the Android Market. Let’s see how much more time the countdown takes to reach the 25 billion mark.